If you have visited my blog within the past few days you have probably realized that I am interested in the further development and use of non-recirculating, totally passive hydroponic systems which are extremely easy to use and require no electricity or high setup costs. These systems are very important due to the fact that if made cheap and reliable enough they could vastly reduce the costs and water usage of agricultural crops around the world, making food cheaper, much more widely available, giving people in third world countries independence over the conditions of their soil allowing the cultivation of a wide variety of crops in areas where it was previously simply not possible. However the fact is that currently the knowledge we posses about totally passive systems and the reliability of such implementations (and more importantly their robustness) has not been studied widely enough. For this reason I decided to start a project called the Massive and Passive Hydroponic Project or MPHP which is my attempt to use the internet - and most importantly the people who are interested in hydroponic around the world - to research this topic and get experimental results over different parts of the world, with different conditions and with totally different plant species. Certainly many people will think that the information obtained in this way will have a ton of variability and therefore little value to further research on this field. On the contrary, I believe that - although such variability does exist - it could bring us very important and relevant information regarding the robustness and implementation easiness of such systems all around the world. Surely if these type of systems are to become good enough to replace a significant part of an agricultural setup they will need to be very robust and adapted against a wide variety of different conditions. This is what I want to find out with this project. Thank you again, I really like your idea and I will find some thing to establish my own passive hydroponic system. Hi Daniel, I don't see many posts here of people that are participating. It is not time to start this project yet for me here in Iowa, but is worth considering. New to the site, i'm not sure you have the results from other particpants somewhere else. 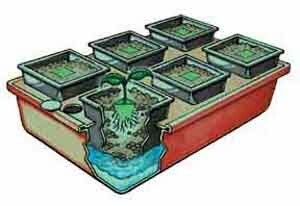 I am new to hydroponics, and excited to investigate your page, and I have downloaded the nutrient program. So that's my story, kind of late to the hydro/agriculture world being in my 50's, but with some college study in physics and chemistry I can see the potential in your ideas.